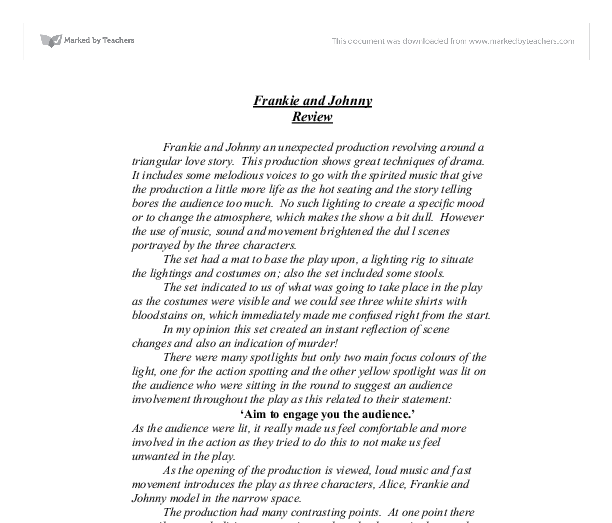 Frankie and Johnny Review Frankie and Johnny an unexpected production revolving around a triangular love story. This production shows great techniques of drama. It includes some melodious voices to go with the spirited music that give the production a little more life as the hot seating and the story telling bores the audience too much. No such lighting to create a specific mood or to change the atmosphere, which makes the show a bit dull. However the use of music, sound and movement brightened the dull scenes portrayed by the three characters. The set had a mat to base the play upon, a lighting rig to situate the lightings and costumes on; also the set included some stools. The set indicated to us of what was going to take place in the play as the costumes were visible and we could see three white shirts with bloodstains on, which immediately made me confused right from the start. In my opinion this set created an instant reflection of scene changes and also an indication of murder! There were many spotlights but only two main focus colours of the light, one for the action spotting and the other yellow spotlight was lit on the audience who were sitting in the round to suggest an audience involvement throughout the play as this related to their statement: 'Aim to engage you the audience.' ...read more. stillness. After seeing these contrasts, you could tell that the pace of the action moving along did change from time to time as part of the play was moving at a steady rate, whilst some was just performed in a rapid tempo showing how stillness vs activity shows more creativity in the sense of rhythm of the play. The timing of the production was quite old around the 1930s and that too in America, which suggests that the Great Depression was going on in them days. The Depression meant unemployment and an economic crisis. This links to the appearance of Frankie and Alice who in the play had a dress on with a different colour. In the depression period the people used to dress up quite fancily and so the costume that the two characters had on were actually reflecting the time and the place of the play that was influenced from. However the characterisation of Alice was portrayed in a way that made her suit the role of the 'other women,' as Alice had a very sweet and low voice and the way she used her physical skills showed that her motivation of being a cause of the conflict was depicted solidly. Alice also had a red fitted dress on which immediately as she entered related to us of the role she portrays. ...read more. these compelling ideas were influenced from the historical epic theatre performer-Bertholt Brech. Brech used his influential methods of plays being acted out freely, as he showed all of the changes of character, scene, atmosphere all visible to the audience vision. Guided from his ideas, Frankie and Johnny have adapted the techniques of the style being broken up, scenes being order less in a montage and a story within a story as a parallel story. 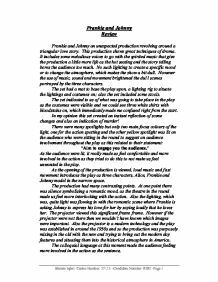 These methods made the production extraordinary and kept our interest throughout the play. And to end the show, there were forensic tests done by the two female audiences as the music and the pace of the play was slowed down symbolising the sorrow of jealousy. So overall the production had all the ingredients of a skilful piece of drama, spirited music, contrasting movements, melodious voices, interlocking staging in the round, mixture of cultures-American accent and British accent, combination of the classic with the modern and influential methods that were portrayed in a sequence of scenes. A highly interesting production by the blah blah blah company who have with great creativity produced a mind blowing show aimed at teenagers. Personally, I thought that the production was very exhilarating for young minds like me. If there was more of this type of a production performed then there will be an increase to the knowledge into skills and techniques of drama. Shaista Iqbal- Centre Number: 37113 -Candidate Number: 8282 -Page 1 ...read more. The only criticism I will mention though is the slight in-ability I, as the audience, found to warm to the characters as it was done in a way that at times wasn't that believable. Out of the males, the character that I thought was by far the most entertaining and the most individual was Ian. 12 angry men is a production about a murder trial. Humphrey was extremely good at playing this character because he could be angry but not need to shout. Most people when they get angry on stage get turned into shouting mode and then cant get out of it. Humphrey was great at telling his lines he went up and down in anger depending on what the juror was saying. The route to achieving good production sound - pre-production process. Well, career life & death for the novice director/producer can be decided in the screening room, so why should we act any differently? To increase the chances of success, employ an experienced specialist! Don't wait until major mistakes have taken place either in the planning or production phases of the show. Use of lighting and sound: monologues were shown with a spotlight isolating the rest of the stage to draw on emotion and atmosphere. It also made the audience focus on that one person and no one else. The individual spotlights also showed individuality with the idea of separating all the characters. This meant researching important events and getting an insight into what people were like in the sixties, how they behaved, how they reacted to scandal such as teenage pregnancy, and other social taboos, to help us play the parts convincingly.